A straw poll of cyclists will reveal that theft of bicycles isn’t uncommon, and most cycling communities will have stories of thefts from members. Stolenbikes shows 242 reported cases in the last 6 months in the centre of Reading alone. Strong locks are very often heavier, and more expensive – not everyone is willing to purchase and carry one around – hence many bike shops do sell light, cheap alternatives. In the vast majority of cases, these are very easy to chop through. The standard, independent rating system for bike locks is overseen by ‘Sold Secure’, and most reputable brands have their locks rated by the authority, and the rating displayed on the packaging. A ‘Sold Secure Bronze’ lock is the lowest rating they will offer, and these locks are often cheaper and lighter, but offer less protection than ‘Silver’ and ‘Gold’ varieties – Gold being the strongest. Your best bet to avoid theft is to go for Gold – and in many cases, if you have bicycle insurance, it will not be valid unless you do so – you should check this on your policy details. 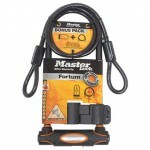 Masterlock Street Fortum D Lock – £43.19 – this D-lock comes with a mount, as well as a 10mm cable to keep your wheel secure, giving you an all in one package. Abus City Chain Plus Lock – £89.99 – At 2.25kg, this Granit chain is heavyweight, and ideally would be used if you’re leaving the bike in the same position on a regular basis, and able to keep the lock in situ. 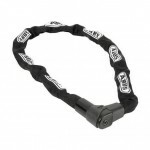 This uses a key locking system, with Abus-Plus cylinder which promises to be tough to pick. There is a textile cover around it, so if you did want to travel with it, it would be uncomfortable. 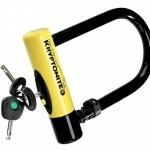 Kryptonite New York 3000 – £53.99 – This 16mm thick shackle is teamed with a double deadlock and high security disc-style lock cylinder. The D shape itself is fairly shallow, leaving little space for manoeuvre. 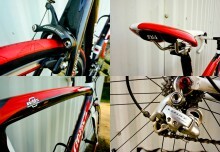 A D-lock on the frame, and cable lock looped between the wheels is the absolute best method of defence. 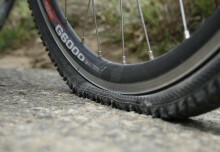 The smaller the loop on your D-lock, the closer it will pull your frame to the locking object. This leaves less room for a thief to obtain any leverage, making theft with bolt clippers or other tools much harder. If you park your bike in the same spot daily, for example on a bike rack at work, consider asking if it’s possible to leave your D-lock in position. Most have an anti-corrosion cover to go over the keyhole, and this saves you lugging extra weight on your commute. 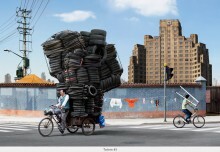 It isn’t uncommon for a theif to target only wheels or a saddle. You can protect yourself by looping a cable lock through the wheels, but lockable skewers and seat post camps are also a fantastic anti theft device. Most of these require a unique key to be removed. Where you lock your bike is important, too. 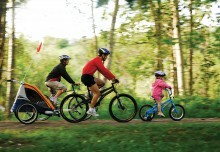 Always select a dedicated bike rack, or a very sturdy object, such as a lamppost. Railings are notoriously easy to break, and often the thief will leave with the lock still attached. Bike thieves are very often opportunists – they’ll look for a bike that is tantalizingly easy to take – and there are a lot of them, so don’t let yours be one. A bike parked close to a CCTV system, in a crowded public place, on a lit street, is a lot less enticing than a lonely steed in an alley. Think carefully about your selection and choose somewhere uninviting to someone who doesn’t want to leave any evidence. The action of getting your bike tagged is unlikely to prevent a theft – but making it clear that it’s tagged is definitely a deterrent. The UK’s leading online bicycle ID and registration system is run by Bike Register, and they often work with local police services to offer tagging days for cycling clubs and in shops. The tag is applied to the underneath of your bike, and if you choose to you can display stickers on the top tube to show it’s been marked – this makes the bike a more risky theft and cuts down the likelihood of losing it. A tagged bike also means in the unfortunate event you are unlucky, you can provide police with more information, and you have proof of ownership if it is recovered.